We’re, of course, not even talking about schools and education. We’re pretty sure all schools want to stay away from the devil’s toy for good reason. At one point these fidget spinners were simply designed to be nothing more than ADD-ADHD rehabilitators, but in turn they seem to distract kids tremendously from doing the job they need to do. So the backlash has been huge. Thankfully, fidget spinners have evolved — into something more. Stunningly, there are now tons of ways to utilize fidget spinners — some of them in ways that don’t even involve kids! Shocking, right? BRAVA Marketing, for sure, has seen the light and is shocked just as much as you are, which is why you can actually peruse and browse some of the cool selections they have for your promotional marketing needs. Ever Heard of the ‘Cube Spinner’? — Really awesome stuff, and there’s a particular kind of business that would benefit from it. Right here. Pay Close Attention to the “Shape” of the Fidget Spinners — Why? Because they might make a statement based on a certain nonprofit cause. Night Clubs and Dance Floors Might Actually Love These Toys — And here’s why. And you can bet that if there are already three ideas for these items, other businesses might come up with waaaaay more. The possibilities might be endless. Get in on this new promotional product immediately. When you find what you’re looking for, contact us right away! Well worth the investment given how popular fidget spinners and all of its variants have become. Just don’t let your kids get a hold of your promotional items, or you might never see them again! Why not stock up on these cube spinners and brand them in the name of your daycare center? Truly genius. And it sticks in the mind of (not the kid, because the kid wouldn’t care) the PARENT. Or parents. The lasting impression of their kids being taken care of on a regular basis is more than enough to instill a sense of loyalty and customer satisfaction. 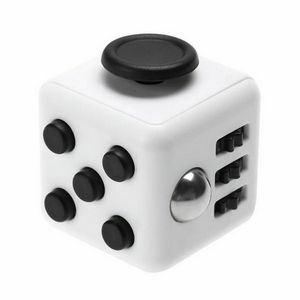 You could even have slightly different versions of cube spinners in stock to give away as gifts to those lasting customers bringing in their kids. Then what happens? 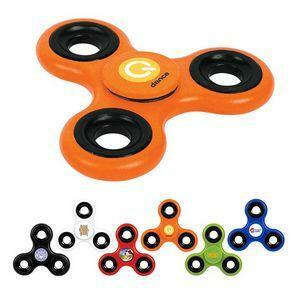 Those kids bring those cube spinners back home — with those spinners branded in your business name…. Just contact us right now. BRAVA Marketing has a long list of possible designs for you. And since cube spinners are very much the rage these days, you want to take advantage of that as much as possible. These are what kids want! It’s remarkable what you can do with fidget spinners from a value standpoint. Case in point, check out the fidget spinner you see on the right. 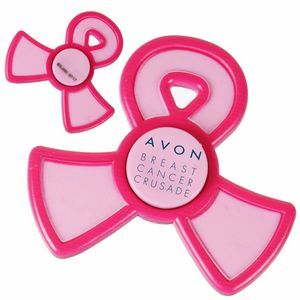 What you’re seeing is a promotional gift to celebrate one of the best movements out there in the United States — cancer awareness. The pink ribbon has long been a staple for the movement to eradicate cancer from the Earth, and without a doubt, coupling that with such a viral item as the fidget spinner is genius enough for promotional marketing and advertising strategy. Imagine your company, corporation, nonprofit, or any such group supporting cancer awareness and offering to customers, clients, and colleagues the very best gift — these custom fidget spinners designed to make a statement. That you care. Definitely worth the investment for your business or even yourself, especially for such a good cause. All you need to do is contact BRAVA Marketing right now. BRAVA Marketing has the latest designs of fidget spinners for you to choose from, but if you’re interested in a great cause, this one you see here is available. After making those purchases, you can support the cause yourself and even help others support the cause by selling them or giving them away as gifts. Promotes your business. Your health. And you.